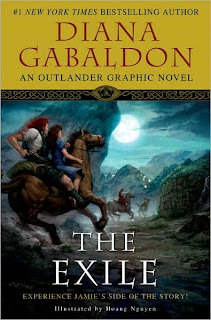 One can’t help but wonder who will be the market for The Exile (DelRey), the first graphic novel from mega-bestselling author Diana Gabaldon. Gabaldon’s Outlander series is well-known and well-loved... but mostly not by regular readers of graphic novels. That said, The Exile is beautifully written and realized, and the artwork -- by Hoang Nguyen (Metal Militia) -- hits just the right notes of dreamy mysticism to illustrate Gabaldon’s historical, time-traveling stories. Interestingly, The Exile is told partly from the viewpoint of Jamie, the lead male character in the Outlander novels, which are usually told from the view of Jamie’s wife, Claire. Whether this was to accommodate the largely male graphic novel readership or simply so that Gabladon could change things up is unclear. Either way, my own misgivings aside, it’s clear that The Exile is going to be a huge seller. As always, everything Gabaldon touches turns to Scottish gold. Doubleday Canada is the Canadian publisher of this beautiful book, and newest addition to my Gabaldon library. Will Oprah Give Franzen the Book Club Nod? Again.